Central Region Fire Brigade was formed as a result of Local Government reform on the 16th May, 1975 from part of the former Central Area Fire Brigade, part of The South Eastern Area Fire Brigade and part of Perth and Kinross Fire Brigade. In 1996 the name was changed to Central Scotland Fire Brigade with out boundary change. The Brigade covers the areas of Clackmannanshire, Falkirk and Stirling Councils an area of 2,652 Square Kilometres with a population of 281,600. The Brigade is governed by the Central Scotland Fire Board Fire Authority which consists of eleven members, three from Stirling Council, six from Falkirk Council and two from Clackmannanshire Council. They have adopted the motto "Protecting the Heart of Scotland"
On Friday the 17th September 2004 the Brigade changed it's name to Central Scotland Fire and Rescue Service, this was a name change only, there was no change in the area covered. 1984 to 1996 Firemaster I S T Adam OBE QFSM GIFireE. 1996 to 2000 Firemaster I S T Adam OBE QFSM GIFireE. 1979 to 1984 Meiklehill House, KIRKINTILLOCH. 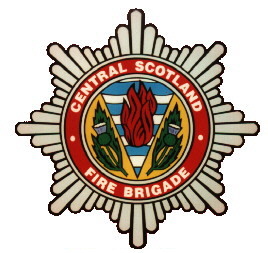 1996 to 17/9/2004 Central Scotland Fire Brigade (This was a name change only, no area change). 17/9/2004 to Central Scotland Fire and Rescue Service (This was a name change only, no area change). 12/6/2010 In the Queen's Brithday Honours list Watch Manager's James Allardice, Crianlarich and Allan Brodie, Tyndrum were awarded the Queen's Fire Service Medal. 16/10/2009 Chief Fire Officer Steven Torrie has asked the Joint Fire and Rescue Board for permission to retire and if approved he plans to retire on the 1st of April 2010. Mr Torrie has been in the Fire Service for 35 years starting in Lothian and Borders Fire Brigade and spending the last 3 years as CFO at Central Scotland Fire and Rescue Service. As of the 1st of April 2009 the Volunteer stations at Crianlarich and Tyndrum have been upgraded to Retained Units. Firemaster John Early is to retire around April 2006, his successor will be Mr S. Torrie currently Deputy Chief Fire Officer for Lothian & Borders Fire and Rescue Service. Monday 31st October 2005, Deputy Firemaster Geoff Williams retired.